This document outlines the defence's case in words that legal people like to use and forces the prosecution to respond with it's case. 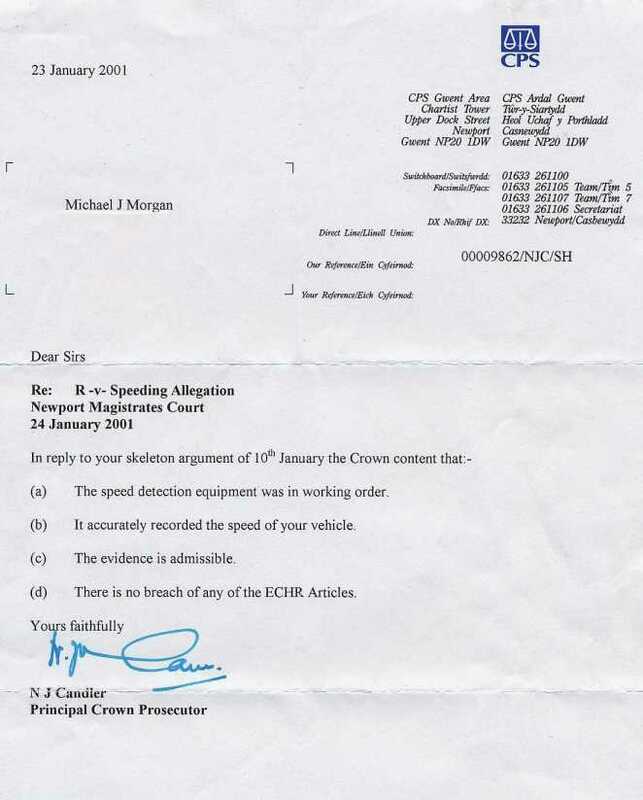 The CPS are supposed to be independent of the police, but watch out for them - the second point in their response to our skeleton argument refers to speed measurement equipment that wasn't being used! The prosecution case is said to be based on the PROVIDA system. The prosecution has provided to the defendant a copy of the Traffic Video. The evidence, if any, of the recording is of the speed of the police vehicle only. The recording contains no evidence of the average speed of the defendants vehicle or of the distance over which the speed of this vehicle was monitored by the equipment. Furthermore, the defendant will contend that as the evidence is based on opinion it is inadmissible without corroboration. In the circumstances the defendant will submit that the recording contains no (or no reliable) evidence of the speed of his vehicle. The defendant will submit that the fact he was randomly selected only because he was at the rear of a line of traffic is unlawful under the provisions of the Human Rights act. A number of other vehicles were travelling at much the same speed. The police officer has given no explanation for pursuing the defendant rather than of the other motorists. The police officers evidence regarding his vehicles speedometer reading is unreliable in view of the inconstancies between the remainder of his written evidence and the video recording.